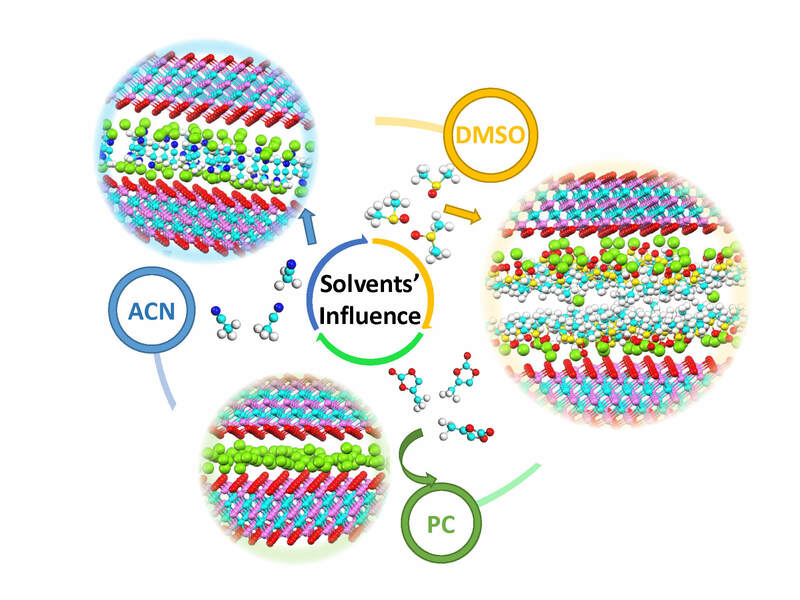 MXene electrodes were soaked in lithium-based electrolytes in three dramatically different solvents (acetonitrile, ACN; dimethyl sulfoxide, DMSO; and propylene carbonate, PC). The PC solvent produced the highest energy density because lithium ions were “naked” (not surrounded by solvent), allowing the tightest packing of positive charges between MXene layers. Credit: Drexel University/Oak Ridge National Laboratory, U.S. Dept. of Energy; schematic by Xuehang Wang and Lukas Vleck. OAK RIDGE, Tenn., March 4, 2019—Scientists at the Department of Energy’s Oak Ridge National Laboratory, Drexel University and their partners have discovered a way to improve the energy density of promising energy-storage materials, conductive two-dimensional ceramics called MXenes. The findings are published in Nature Energy. The surfaces of different MXenes can be covered with diverse terminal groups, including oxygen, fluorine or hydroxyl species, which interact strongly and specifically with different solvents and dissolved salts in the electrolyte. A good electrolyte solvent–electrode match may then increase charging speed or boost storage capacity. The work was part of the Fluid Interface Reactions, Structures and Transport (FIRST) Center, an Energy Frontier Research Center led by ORNL and supported by the DOE Office of Science. FIRST research explores fluid–solid interface reactions with consequences for energy transport in everyday applications. 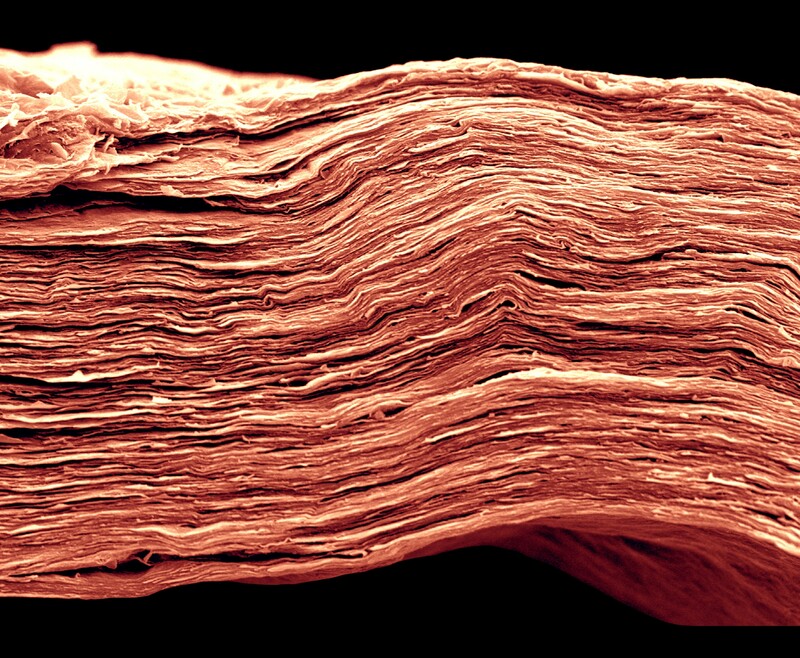 Drexel’s Ke Li synthesized the titanium carbide MXene from a parent “MAX” ceramic—containing titanium (denoted by “M”), aluminum (“A”) and carbon (“X”)—by etching out the aluminum layers to form five-ply MXene monolayers of titanium carbide. Transmission electron microscopy revealed the structural integrity of the materials before and after electrochemical experiments, whereas X-ray photoelectron spectroscopy and Raman spectroscopy characterized the MXene’s composition and the chemical interactions between the MXene surface and the electrolyte solvent. Electrochemical measurements showed that the maximum capacitance (amount of energy stored) was achieved using a less conductive electrolyte. This observation was unusual and counterintuitive because one would expect a commonly used acetonitrile solvent–based electrolyte, having the highest conductivity of all tested electrolytes, to deliver the best performance. In situ X-ray diffraction showed expansion and contraction of the MXene interlayer spacing during charging and discharging when acetonitrile was used, but no changes in the interlayer spacing when the propylene carbonate solvent was used. The latter solvent resulted in much higher capacitance. Furthermore, electrodes that don’t expand when ions enter and exit are expected to survive a larger number of charge-discharge cycles. Finally, molecular dynamics simulations done by Vlcek revealed that interactions among the lithium ions, electrolyte solvents and MXene surfaces strongly depend on the size, molecular shape and polarity of the solvent molecules. In the case of a propylene carbonate–based electrolyte, the lithium ions are not surrounded by solvent and therefore pack tightly between MXene sheets. However, in other electrolytes, lithium ions carry solvent molecules along with them as the lithium ions migrate into the electrode, leading to its expansion upon charging. Modeling may guide the selection of future electrode–electrolyte solvent couples.